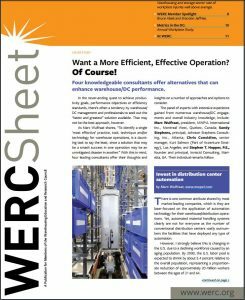 Want a More Efficient, Effective Operation? Of Course! Sandy Stephens, Managing Principal of Johnson Stephens Consulting, provides insight into how to capitalize on “effective” managers, resulting in enhancing warehouse/DC performance. Excerpts from the full article as published in May/June WERCSheet.